We can see the shape of our CSV files. There are 8 columns, all pretty explicit and containing the average for the month in column month except for raindays and snowdays which contains the number of days in that month where it rained and snowed respectively. Note: I currently count raindays as the number of days where the rainfall is above 5mm (which is completely arbitrary). If you look at the website I scraped it does contain a column for rain days but some days are marked as rain days when there is no rainfall and the reverse. Even then it's not really accurate as I'm only interested in quality of life and rain at 4am is not annoying lots of people. Cool. Let's try plotting something first to see if everything is okay and load the other cities. While we could continue having one DataFrame per city, it is more convenient to have one DataFrame containing all the data as this allows us to use plotting directly from it like we did above. We can also use .describe() on a DataFrame instead of doing .median(), .sum() etc on every single column to have a quick overview of all the variables. 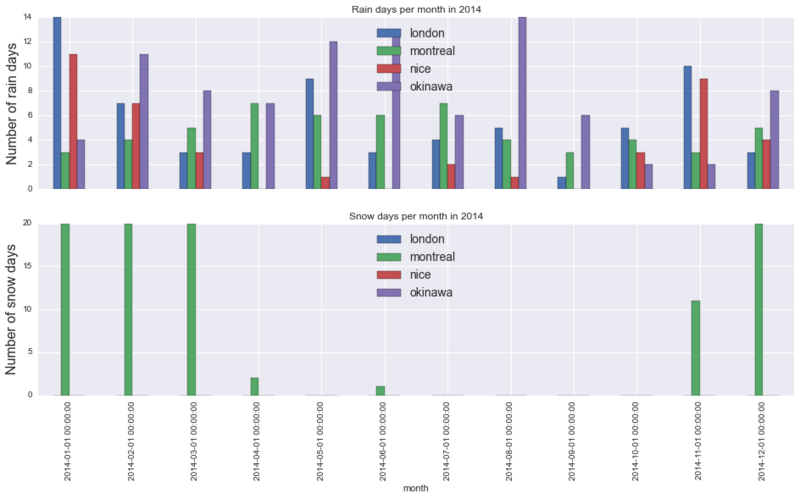 """Plots the dataframe grouped by location for the given column"""
For the next plots, let's focus on 2014 only in order to have an idea on how a year looks like in those cities. Montreal winter is pretty damn cold but is not really humid, which makes it not THAT bad and Canadians know how to do proper insulation. Summer is quite nice all around, nice temperatures and pretty dry. Nice is good all year round, it sometimes gets below 10° but never reaches 0° while being dry. Having grown up there I feel like I have been spoiled when it comes to weather. London is average but we can see the winter is very humid, which is the reason why I feel colder when it's 0° in London than -15° in Montreal. Okinawa looks really good until you experience that summer humidity. For those that haven't lived in a tropical climate, it means that you are sweating an awful lot very quickly and air con is a necessity. To finish this notebook, let's have a look at the rain and snow data. We can see it's raining quite a bit in Okinawa since they have a rainy season (May-June) and a typhoon season (June-November). Nice is probably the nicest, having close to no rains during summer. 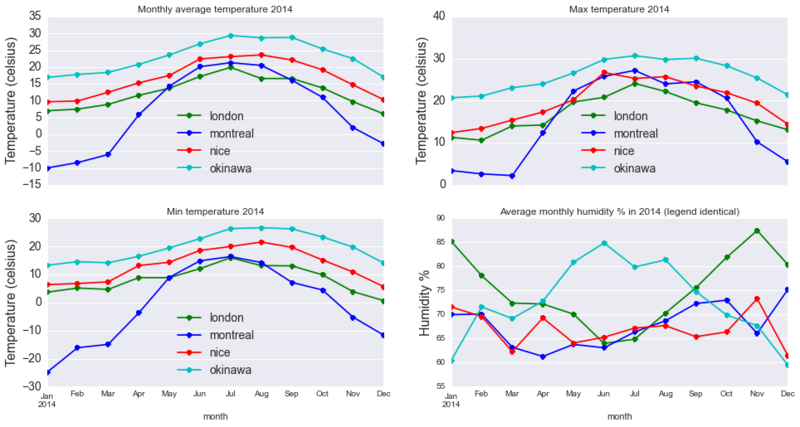 When it comes to snow, Montreal is the only contender as snow in Nice and London is very rare and it hasn't snowed in Okinawa for over 30 years. Okinawa and London are tied for completely different reasons: one has the legendary British weather and its 2 weeks of summer and the other is so hot and humid that it can be hard to breath at times (but you get amazing sea and beaches). Now that you have seen how to use Pandas (for those that had never tried it before), it's up to you to finds things to compare. Do share them when you do as it is always interesting to read.